To view 7 more pictures, interactive maps and the full, detailed description of the The Grove at West Neck (55+) community, please Login. Find new homes in The Grove at West Neck where land and architecture blend together seamlessly. These houses for sale are built right along The Signature at West Neck Golf Course for those ages 55 or more. This active adult community is located in Virginia Beach, VA, which allows residents to easily access shopping and entertainment. Veterans will be pleased to know that military bases like Joint Expeditionary Base Little Creek-Fort Story and NAS Oceana are not far either. The houses for sale in this neighborhood have an understated elegance that homebuyers can’t easily find new homes with in today’s market. Builders have made such good use of the expansive land that each residence looks right at home. 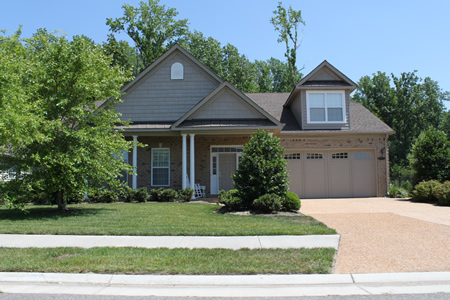 Every home in The Grove at West Neck may come with brick exterior front, metal roof accents, porch, oversized garage door with opener and remote, double floodlight at rear entry, professional landscaping complete with front yard of sod and more. Tour one of the models of these houses for sale and see stylish features throughout. In Hampton Roads, it isn’t everyday one can find new homes with all the bells and whistles. Each home in The Grove at West Neck may include custom cabinetry, elevated toilets, GE appliances, rocker light switches, 10-foot ceilings, gas fireplace with slate surround, hardwood flooring, glass enclosed shower, natural gas heating and more. Virginia is a land of timeless beauty. Virginia Beach is fine example of this unspoiled splendor but gives the great addition of city amenities. Those who know that eating healthy is the way to a long life can go to the u-pick farms in Pungo. The Virginia Beach Farmers Market also offers many locally farmed foods that residents can enjoy cooking, eating, sharing and canning. The Signature at West Neck Golf Club is literally in the backyard. Play rounds of golf, bingo and poker. And bring hearty appetites for those Sunday morning brunch buffets. Houses for sale in this great golfing land can be exactly what homebuyers have been searching for. Active adults can find new homes on this challenging golf course and live the life they always wanted. So get in the groove at The Grove at West Neck. Send me more information about the The Grove at West Neck (55+) new home community. Our agents gladly offer FREE property tours of The Grove at West Neck (55+), Virginia Beach and homebuyer consultations to all serious buyers.